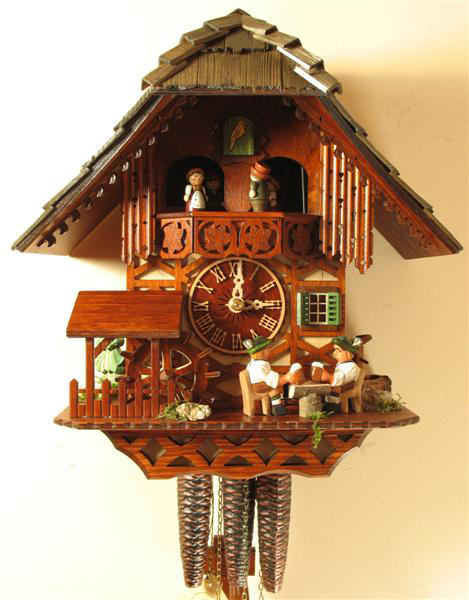 All the carvings are done by hand on this charming and typical Black Forest clock. The clock comes packaged in genuine recycled materials. Each clock made and packaged BY HAND by Black Forest craftsmen the same way they have been for hundreds of years. The cuckoo bird, hands, numbers, and dancers are all made of solid wood. The bird and dancers move along with the mechanically produced music and cuckoo call. The sound of the bird is produced by real wooden whistles and the music comes from a real mechanical music box. This fine piece is by Rombach und Haas and is exclusively available through North Coast Imports. It is an Official Black Forest Clock, certified by the VDS..